IrPowerweb Review 2019: Is IrPowerweb a Good Hosting? irPowerWeb is a web hosting company based in Shiraz, Iran. It was originally founded in 2004 as Media Gostar Datas (Ltd). The vendor offers a wide range of internet services including web hosting, dedicated servers, domain name registration, and SSL certificates. 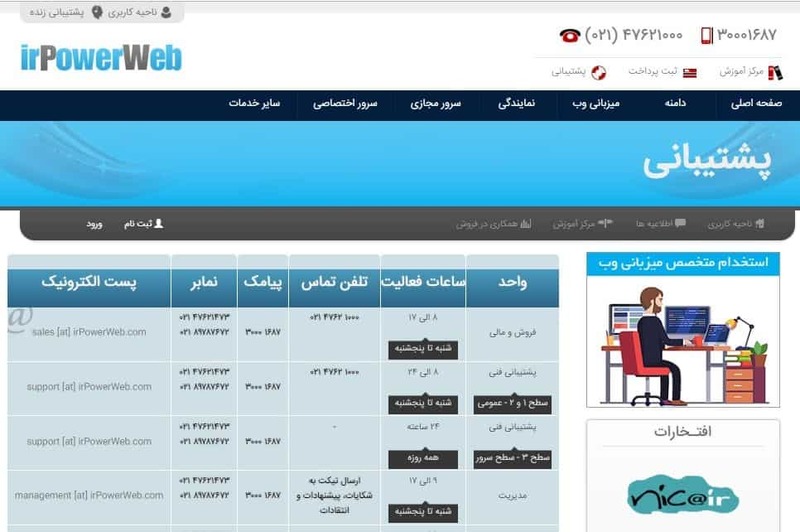 irPowerWeb is an Iran-based hosting company that was operating as Media Gostar Datas (Ltd) from 2004 to 2008, when it changed its name to irPowerWeb. The vendor prides itself on providing services to more than 200,000 local customers. The vendor offers a wide range of hosting-related solutions that include domain registration, shared hosting, reseller hosting, email hosting, virtual private server, dedicated server, and SSL certificates. The irPowerWeb website is available in Persian but its knowledge base is also available in English. irPowerWeb’s dedicated servers are in highly secured data centers located in Iran and Europe. The data centers are equipped with world-class infrastructure providing the best hosting environment for maximum performance of its servers. In addition, this vendor hosts its clients’ websites on high-speed SSD drives. This will help improve the loading speed of your website up to 20 times compared to websites hosted on HDD hard drives. The virtual servers of this hosting provider are based on some of the world’s best cloud servers powered by Dell. The vendor also uses Xen virtualization platforms to increase the speed of access to information on its servers. irPowerWeb’s hosting solutions support both Linux and Windows OS platforms. Customers can choose a variety of operating systems including, CentOS, Fedora, Debian, Ubuntu, VMware ESXi, Windows Server 2008, R2 Standard, Windows Server 2012, and Windows Server 2010. With irPowerWeb, customers get remote backups performed on a weekly basis. The vendor performs over 850 backups each year for free. What’s more, it offers FTP backup packages as additional backup plans for clients who would want more secure websites and more storage space for their backups. Its most basic FTP backup plan, FTP A, includes disk space of 10GB and 50GB monthly traffic. On the other hand, FTP F is this vendor’s most advanced backup plan. It comes with 100GB disk space and up to 1000GB monthly traffic. All of the plans provide access to DirectAdmin Panel and cPanel for easy management. 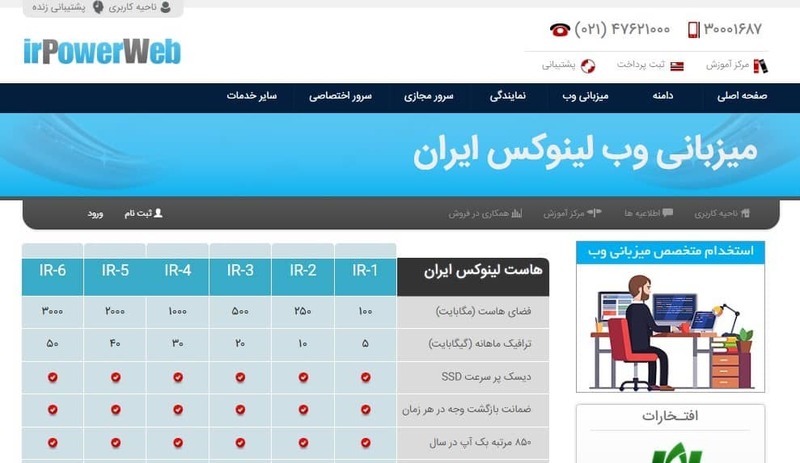 irPowerWeb has pretty cheap hosting packages with prices listed in Iranian toman. The vendor’s hosting plans come in flexible billing cycles, including monthly and annual subscriptions. In addition, this vendor offers monthly discounts to customers who make annual payments. irPowerWeb’s refund policy is somewhat different from other vendors in the market. While other hosting providers will limit their money back guarantee to, say, 30 days, this vendor is comfortable with refunding its customers at any time, if for whatever reason, they become dissatisfied with the quality of its solutions. All the same, it is important to note that the vendor will not refund you for the past hosting period; it will only return the remaining credit of the purchased services for the remaining paid billing cycle. In addition, the hosting firm also maintains server availability of 99.9%. If you need technical assistance, you can contact the irPowerWeb customer desk via telephone, email, or ticket. The vendor does not have a live chat though it includes an invalid link to a live chat. The customer support team is stated to be available 24/7/365, yet my email to them received no response. In addition, the irPowerWeb knowledge base is fairly detailed. irPowerWeb is a good hosting vendor with hosting solutions designed for SMEs, fast growing startups, and large websites in Iran. With over 15 years in the hosting industry, this hosting provider has become quite a force with its 200,000 local customers. All the same, new customers should expect noteable delays when contacting its support team. Wondering how IrPowerweb stacks up against other Web Hosting companies? Enter any other Web Hosting company and we will give you a side-by-side comparison.